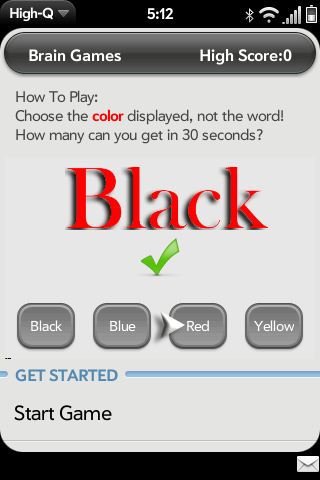 This game is based on the research Dr. J. Ridley Stroop who discovered the strange phenomenon now known as the "Stroop Effect" in the 1930's. In psychology, the Stroop effect is a demonstration of the reaction time of a task. When a word such as blue, green, red, etc. is printed in a color differing from the color expressed by the word's semantic value (e.g. the word "red" printed in blue ink), naming the color of the word takes longer and is more prone to errors than when the meaning of the word is congruent with its ink color. Choose the color displayed, not the word! How many can you get in 30 seconds? Can you make the list? This app is still a work in progress... Open for beta testing.